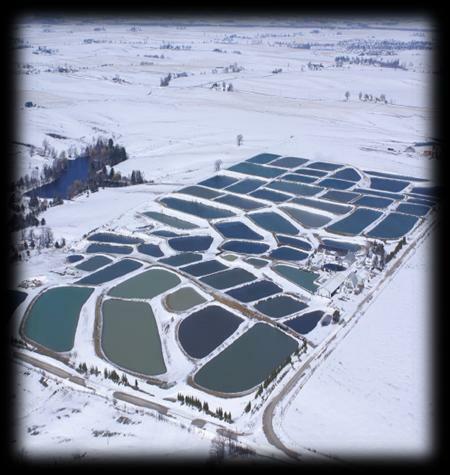 Myron and Ellen Kloubec began their careers in aquaculture over thirty years ago, when they began a fish management business in Amana, Iowa. The farm was originally dedicated to the production of game fish species. Some ten years later, Myron and Ellen learned about koi when their son Nick developed a passion for them. 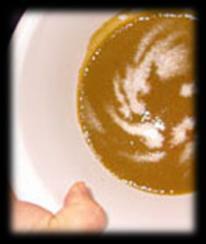 As Nick grew, so did the families commitment and fondness for koi. They devoted a portion of their fisheries business to the spawning and raising of koi. Gradually, the farm reduced its production of game fish species and devoted the majority of the farm acreage to the production of koi. Nestled in the rolling hills of Eastern Iowa, Kloubec Koi Farm looks like a scene from Niigata, Japan. Over 55 mud ponds can be found on the 80 acre farm, terraced into the hills so that the melting snows add pristine water into the ponds—water that is essential to the development of koi. But good water is not the only attribute of the farm; excellent clay is vital to the development of koi, and here too, Kloubec Koi Farms benefits from an ideal location, rich in minerals and clay. Our farm is 80 acres of peace and quiet... perfect for raising Nishikigoi! Read about the Kloubecs in KoiUSA Magazine. Adobe Acrobat is required. Download Adobe Here. Good water, good clay, and good blood lines are essential elements in the production of good koi. All Kloubec’s stock comes from Japanese parents with the best blood lines. Myron, Ellen and Nick carefully select their parent stock to yield impressive spawning results. Recent spawns have emphasized the development of strong shiroji (white ground), which acts as the base color in most koi. Providing a strong hi (red) color is essential to developing a sense of vitality to the fish, and when combined with a forceful sumi (black) lends an air of strength to Kloubec Koi. 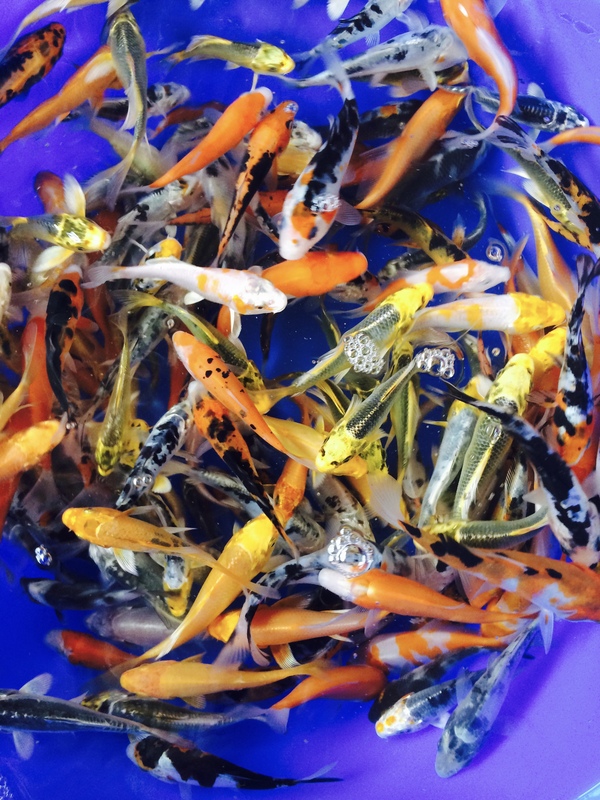 The farm’s efforts in developing their koi have produced outstanding Go-Sanke in recent years.In addition to producing high quality Go-Sanke, Kloubec Koi Farm also caters to the hobbyist who desires something different in their koi. 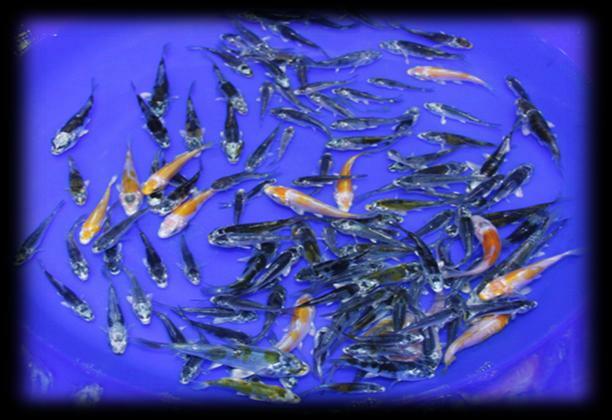 Kloubec Koi Farm produces outstanding Kawarimono, Hikarimono, and has developed a reputation as one of the nation’s premier breeders of Longfin. But being able to produce good koi is only part of the equation in developing a successful koi facility. The other part of the equation is being able to supply healthy fish to the customer on a timely basis. 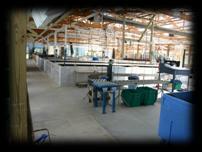 All fish at Kloubec Koi Farm are produced locally, so there is no chance of outside contamination of stocks. Our stock is tested frequently by veterinarians from the University of Iowa and others, and we treat our fish for parasites after they are pulled from the mud ponds. In addition, our treatment and quarantine facilities are state of the art, as is our packaging and shipping areas. We make several shipments of fish per day in our busy season, and can arrange special shipments to our customers anywhere in the U.S.Our passion for koi health extends to koi nutrition, and we have developed special formulas to enhance the hi (red) in our fish, and have contracted with a koi food manufacturer to develop an exclusive line of koi feed that we use on the farm, and have made available to our customers.We believe that at Kloubec Koi Farm, we bring all the elements of koi husbandry together in one place: extensive personal commitment, excellent location, water and clay qualities; the ability to produce outstanding koi, and the diets needed to achieve excellent growth, color and conformation. After 30 years, we still take pride and a personal interest in our customer's search for the perfect pet, and we appreciate their business; because our name is on every Kloubec Koi. 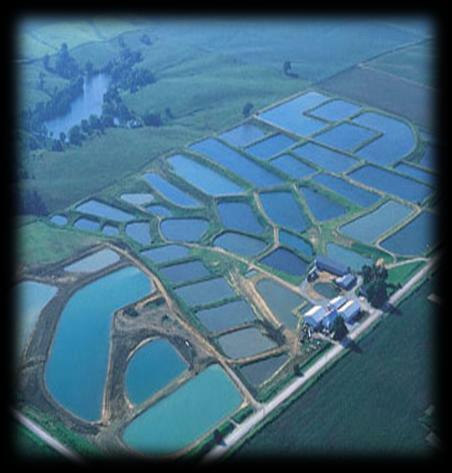 Our Hatchery: The Kloubec Koi Farm Hatchery produces koi by the millions! 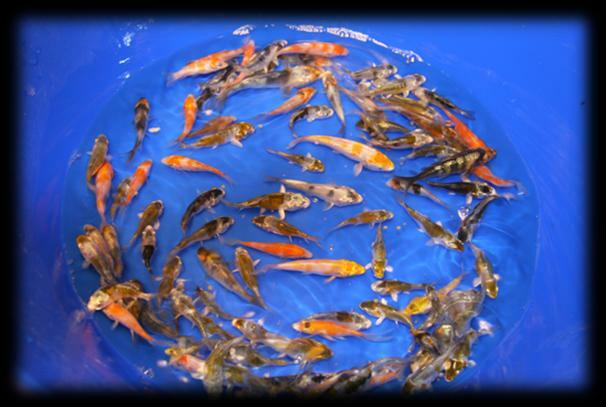 Each batch of koi fry is hatched in a separate water supply to ensure optimum health. Koi Spawning: Myron gently expresses fertile eggs from a tranquilized female koi. 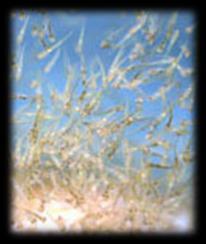 Fertilization occurs in only a few seconds! Our Quarantine Facility: We quarantine our own koi following harvest from the mud-ponds. 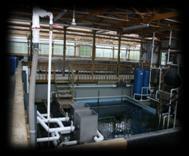 We've expanded the 50,000 gallon quarantine facility again in 2008! Now the new harvest tanks are on a seperate system, to ensure Koi health. Culling : Many, many hours are spent on culling our baby koi. Do you see a future Grand Champion in here? 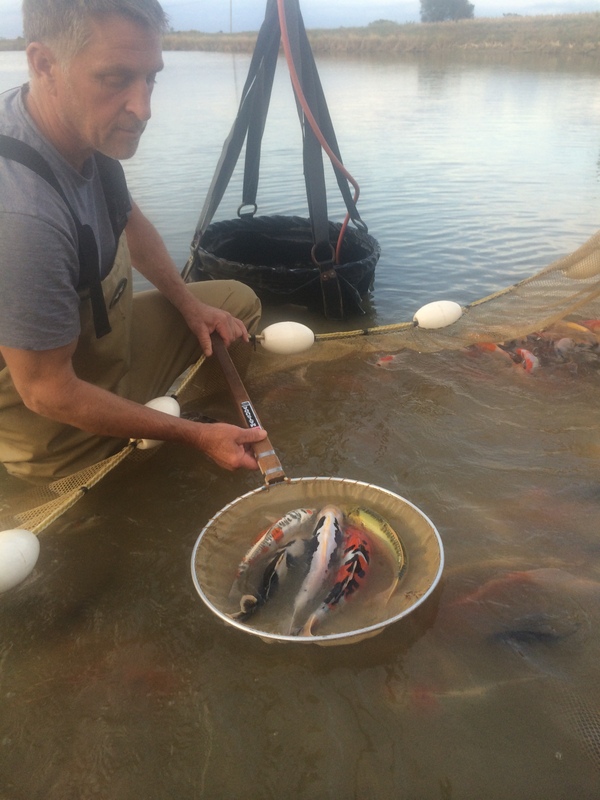 Kloubec Koi are quarantined and treated when they are brought in from the mud pond - so you will receive healthy Koi! Kloubec is the largest Koi Farm in the USA! 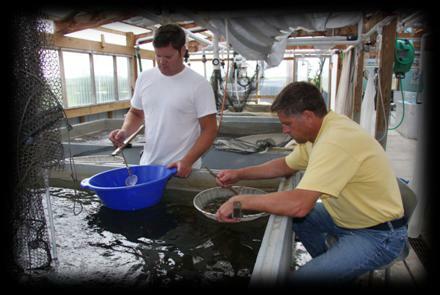 Kloubec Koi Farm has more than 30 year experience in Aquaculture! Kloubec Koi Farm only sells Koi products they use themselves. Kloubec Koi are raised in a cold climate, which guarantees they will be hardy and long-lived pets! Kloubec Koi are raised in natural mud ponds in water quality and chemistry exactly like the Japanese mud ponds where the Koi originated! 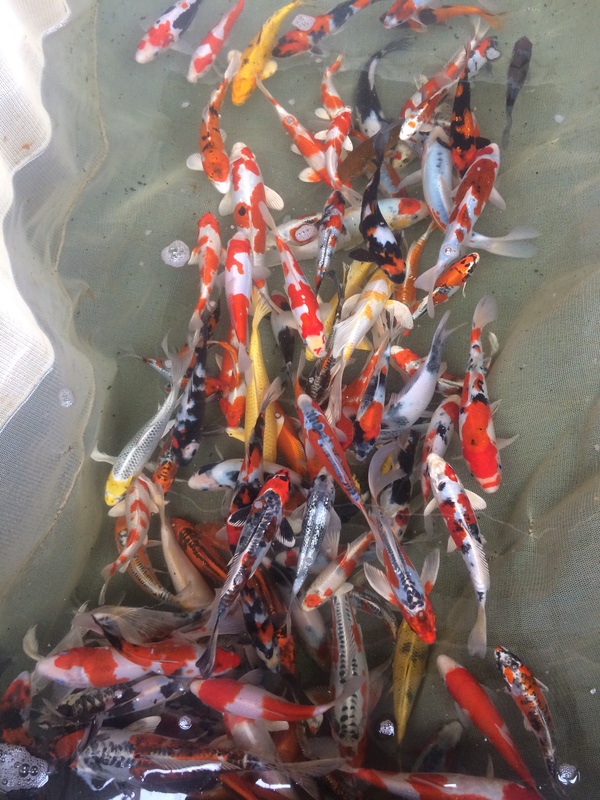 Kloubec Koi are NOT exposed to ANY Imported Koi that could carry disease (no Imported Koi are allowed onto the farm where Kloubec Koi are raised)!